Here is my "ADIS" clone Jukebox UPdate 3-4-11 or 4-03-11 for the Europeans! Why? Because I had this printer stand I bought about 6 years ago and it just had a printer sitting on top of it with nothing in the bottom. We never really use the printer. As you can see, we do keep the bottom locked to keep my 3yr old out of it. Although nothing is in there, but he makes sure he opens and closes the doors about 500 times a day without the locks. My store of choice? Ace Hardware. by the way, how do you post those little pics within the thread, then click on them to make them bigger? And... a 15" ELO Touchscreen from eBay. $103 after shipping. I must say, the seller was from Oklahoma and very well packed and FedEX got it to me in 2 days. *Note : I had to take the door off to match the stain at the hardware store. Not to expensive but about $48.40 over what I thought it would cost. After getting this printer stand down stairs, I had to disassemble the top. It was packed in the bubble wrap, but also in one of those spray foam anti-shock packing boxes. measure the holes on the ELO touchscreen. 3" center of hole to center of hole. Easy. then to mount the 2x4 with 2" M4 screws. That was the only size ACE had. So I had to put a nut on the back side of each screw for shim. I added the legs of the stand prior to attaching the touchscreen. Just snug tightened the screws. Here is the hole cut into the top of the printer stand. I then removed the top and stand again to cut a service hole in the middle shelf of the printer stand for wires. I plan on buying a nice plastic piece to fit the hole later. Chow time! By this time I have about 1 hour into this. As you can see the hole in the top is plenty big for the wires and small control panel on the sides. So, then I carried this thing back upstairs just to see what it would look like. I put the computer and speakers in place. Plugged everything in and instant jukebox! more pics of the instant jukebox. So now that everything works, I powered down. Top back off. Back to the garage with me but leaving the jukebox in place. I then had to cut the decorative aluminum screen I got for a grill. I had to spray paint it as it didnt have a finish on it from the factory. While letting the spray paint dry and let some fumes out of the garage... I then cut the piece of door casing for the trim around the screen. after about 15 minutes of miter cutting on my cheap $6.00 miter saw and box combo. Then back to the screen grill. Then made a lip so I could mount it to the center shelf on the jukebox. then some more cuts so it will bend to make the nice curve in the middle. Then some fit & cutting with tin snips and here is the final grill finish. About 3 1/2 hours into this project. I put the top back on and then re-attached it to the rest of the printer stand. Now it was time for the back to be completed. Here is what the back looked like. and here is the finished product. I removed the backing that was already on it, replacing the bottom portion with peg board to allow for ventillation and to let some of the bass sound out of the back. I also added a hole for the power cord. Then cut and trimmed the former backing to fill in the top portion. I was then wondering how my stained casing would hold up around the touchscreen. I added this foam around the touchscreen to help soften any pressure to the casing that would be applied by people when using the jukebox. Then I attached the casing with my air nailer using 1" brad nails. It no longer is a printer stand, it is now my JUKEBOX! After powering back up here are some finished pics. A pic this morning but I really need to get another camera. When I get a better camera to use, I'll post some better pics. I'm also not 100% happy with the Griffin Powermate. Sometimes it works, sometimes it doesn't. I have installed the latest drivers, but it seems as others are having issues with this thing too! For $50.00 and to work only part time, I'm just not happy! Looks good dude. As for the powermate problem it was discussed on the freebox forums, i think someone posted up a set of drivers that seem to be more reliable. Very impressive. A nice tribute to the original. Killer deal on the touchscreen. There are only one or two things that I think I'd try to do differently if I were to recreate this same basic model. That flat monitor is too tempting to use as a countertop. Perhaps angling it about 30 degrees would help both with discouraging that and with visibility and use? But maybe that would spoil the aesthetics. Also, I'm interested in the Logitech Z4 speaker set that comes with a big volume control pod with line-in, so I'd use that. It sounds nice at our neighborhood Target store. 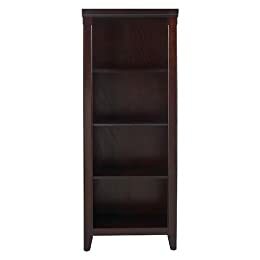 Lastly, the furniture that I'd like to re-purpose is this unit...also at Target. I think it would make a good mostly pre-built stylish enough kiosk where the monitor could be placed at a convenient height and the sub could be incorporate in the bottom. I think it would blend in well in a typical living room. The subwoofer could be incorporated, but the primary speakers may have to be mounted nearby outside of the cabinet to provde enough stereo separation. I really enjoy the jukeboxes like yours. I appreciate the ones that remind me of those at diners and bowling alleys, but I'm always trying to figure out something that will be more acceptable to SWMBO. I have thought about giving the touchscreen an angle. Yes, I already had to tell someone to remove their drink from the top of the jukebox. Funny thing is my 3 yr old hasnt really touched it. I was more worried about the 3 yr old, now I think my worries are with the 30+ yr olds! I have UPdated my simple jukebox. I've added some lights, cooling fans & a little wire management. I also had to replace my motherboard. Now I remember why the old one was in the closet for the last four years. So now my $250.00 jukebox has turned into a $387.00 jukebox. I already had 4 I-Pac's at the house and I added 1 to the jukebox just for the [ESC] key to be able to use the 'options' screen in E-Touch (Freebox). I know there is a option to display the 'options' screen, but NO WAY am I going to let people other than me have access to the 'option' screen. I know I can just hook a keyboard up to it, but I want to be keyboard free! I just put the button on the back where no one other than me knows about it. Might be an expensive button, but it is peace-of-mind to know no one is messing with the 'options'. I did explore the use of the Griffin Powermate long-click feature for access to the 'options' screen, but the Powermate is only about 85% reliable and if I did use it, I just know someone will hold the button down long enough to access the 'options' menu. All is happy with it and my 3 year old loves the light show. Re: Here is my "ADIS" ripoff Jukebox UPdate 3-20-09 or 20-03-09 for the Europeans! You can have the options button set to require a pin input to access. You can do this from the security settings screen, seems a bit overkill to use an ipac just for one key. Obviously the choice is yours though I just thought i would mention it incase you were not aware. I also didn't actually notice but you can still have the queue displayed in a read only mode so users can view it but not change anything. Re: Here is my "ADIS" ripoff Jukebox UPdate 3-29-09 or 29-03-09 for the Europeans! I've added a couple other things to my jukebox. First is these nice little USB ports. I added these to keep me and other out of the bottom of the jukebox. I have complete access to add songs or plug in a mouse/keyboard. These are reversable nad I use the reversed side so not everyone can walk up and plug their USB thumb drive in. I have an adaptor that I use and it works very well! VERY VERY hard to find in the U.S.A. I finally found these in Utah and they were only $4.25 US each. They only had five of them so I snatched them all up. Most websites that carry them are out of them with a 180 day backlog on orders for more. I also added 2 - 10" Neon Speaker Rings and an on/off switch to the sides. Sometimes the Neon's seem a little over-bearing in the house. They did have a little box with them that made the lights beat to the music, but I didn't have any instructions and I wired them backwards and fried the box. The speaker rings where $19.00 after shipping off of eBay. I'll get better pics when the better camera gets back here tonight. I'm now 100% done with this one. It was my first but not my last. I'm in the planning stage of another jukebox for my parents but it will be from scratch. I have a couple of ideas in the works and some small drawings but nothing definite yet. I should start the next one in 3 weeks due to my work schedule. Thanks to all that have viewed and to those who have commented! Also a thanks to Barry Barcrest - creator of E-Touch (Freebox) software. It is a great piece of work and when I get the new jukebox built, I will definitely use E-Touch on that one as well. His support is second to none! Always answered my questions and guided me through what ever issues I've had with E-Touch (which usually was me and not the software)! i was thinking of getting those neon rings to frame my plasma plates... Now i see them again i'm even more tempted. If you plan on ordering more or know wher ei can get a pair let me know dude.